by introducing them to the wonders of exploring and writing about nature. EcoPrints is great for kids who like nature and want to learn to be nature writers. 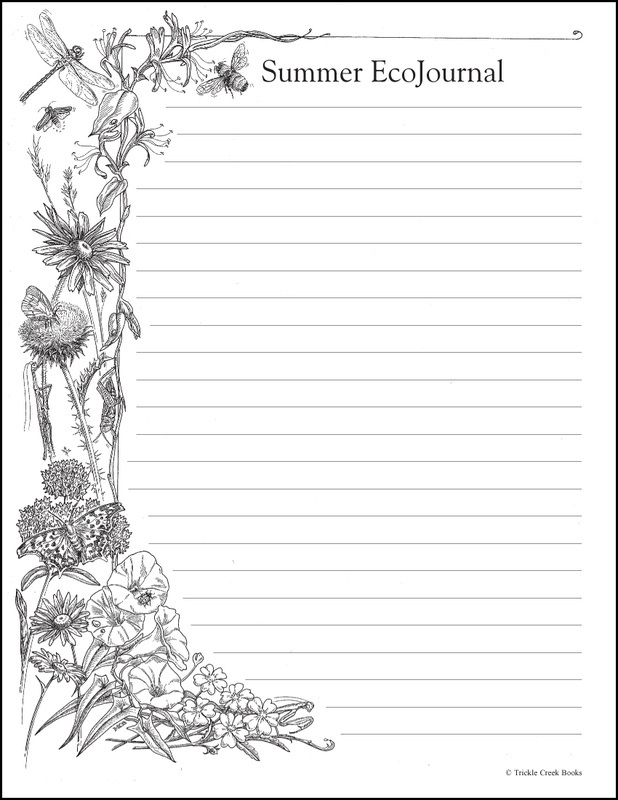 "Just when my students were getting tired of journaling, I introduced EcoJournaling. They love doing nature experiments in the classroom or going outside for inspiration, and they really like the writing ideas on the backs of the EcoPrints. They’re writing like crazy!" EcoPrints by Toni Albert and illustrated by Margaret Brandt, is a complete kit for teaching kids to write about nature. It includes four full-color EcoPrints with inspirational poems for each season, illustrated writing pages, reproducible activity pages, and dozens of unique writing ideas and writing tips. "This Earth Day, have your students get their writing inspiration from Mother Nature and EcoPrints from Trickle Creek. This nature-writing kit includes four full-color nature drawings with seasonal inspirational poems, such as 'Winter Morning' by Ogden Nash and 'Summer Grass' by Carl Sandburg. Also included are specific writing ideas for each season and tips about nature writing and art. For grades 3 and up." Four full-color, 8 1/2-x-11-inch posters (EcoPrints) illustrated by Margaret Brandt. When the four posters, one for each season, are placed side by side, they make a stunning panorama. Inspirational poems for each season. Four beautifully illustrated reproducible writing pages to inspire young nature writers. A guide to nature writing by award-winning nature writer, Toni Albert. She draws on her years of nature writing to give practical advice that makes writing easy and fun. 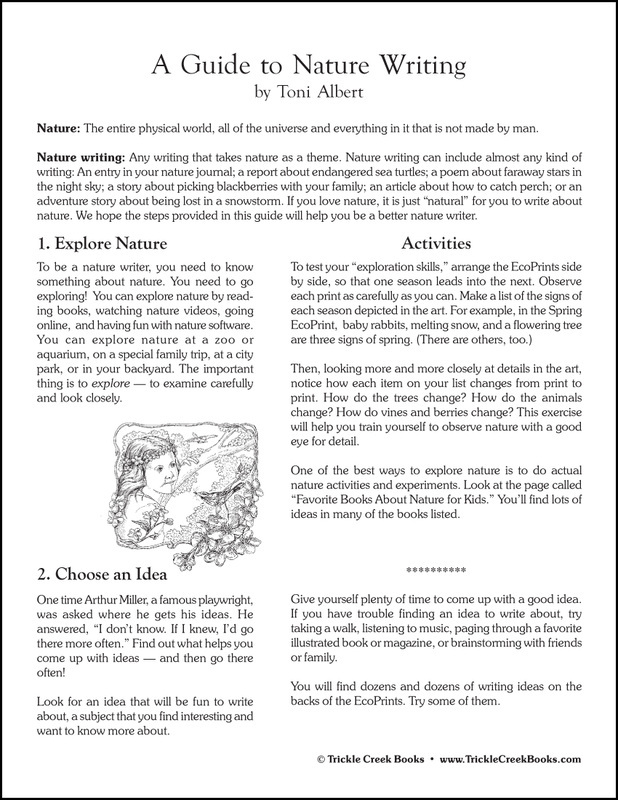 Tips about nature writing. Albert describes her absolute delight in exploring nature and then writing about it. She gives practical advice as she explains her own methods of researching and writing. 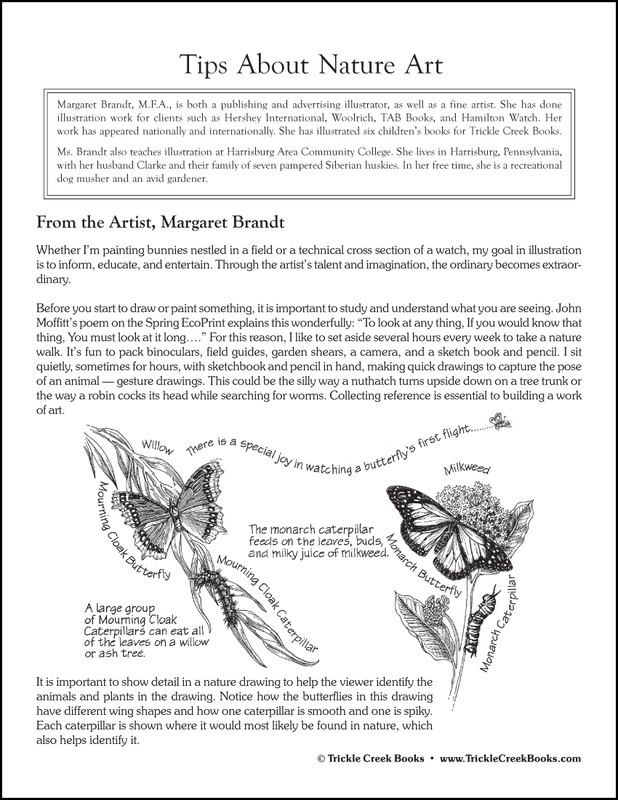 Tips about nature art by Margaret Brandt includes lovely, detailed nature drawings, as she describes the way she works and encourages children to "look long" at nature to "experiment, experiment, experiment" with different media. Dozens and dozens of unique writing prompts. A unusual bibliography of nature books for children. Gives examples of different kinds of nature writing, including fiction stories, an "ecological mystery," a fairy tale, collections of nature poetry, nonfiction books about exploring nature, "how-to" books, nature essays, and collection of nature talks. Great inspiration for kids! A reproducible activity page, "How to Write Haiku." A wonderful way to introduce children to writing poetry. Haiku, a Japanese poem written in three lines, often takes nature as its theme, and it teaches children to observe nature closely by using all of their senses. Go outside and write a sentence describing something interesting that you see. Then look more and more dlosely at the object. Write three more sentences that give additional details. Imagine that the President of the United States announced that human beings are now on the list of endangered species. And the President has asked you to write some recommendations about what we should do to save ourselves. What would you recommend? Write a song that a bird might sing. Find a place to sit alone outdoors. Pretend that you've been lost in the wilderness for weeks. Write! Keep a record of the growth of a caterpillar or tadpole. Make careful observations and measurements. Record the dates of your observations. Sit quietly by a beautiful place outside. Describe the place as completely as you can. Use descriptive words and images to communicate colors, smells, sounds, and textures. Then write another description of the place as you think it will look in fifty years. Roll down a hill and write something silly at the bottom. Describe the perfect tree house. For fifteen minutes, keep a list of everything you touch. (Choose a time when you'll be going both inside and outside.) Then study your list to see how many of the things you touched were man-made and how many were natural. What does this say about our lives? Sell a season. Write an argument to convince the builders of a climate-controlled theme park to choose your favorite season. Astronauts who have had the privilege of seeing Earth from outer space agree that the experience forever changed the way they look at Earth and its place in the universe. Imagine yourself seeing the Earth as a tiny planet in the vastness of space. Write an entry in your daily log describing your feelings and thoughts. EXCERPT from "A Guide to Nature Writing"
One time Arthur Miller, a famous playwright, was asked where he gets his ideas. He answered, "I don’t know. If I knew, I’d go there more often." Find out what helps you come up with ideas—and then go there often!